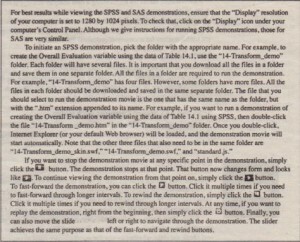 Using the Base module of SPSS out-of-range values can be selected using the SELECT IF command, These cases with the identifying information (subject ID. record number. variable name and variable value) can then be printed using the LIST or PRINT commands The PRINT command will save active cases to an external file. If a formatted list is required. the SUMMARIZE command can be used, SPSS Data Entry can facilitate data preparation, You can verify that respondents have answered completely by setting rules. These rules can be used on existing data sets to validate and check the data, whether or not the questionnaire used to collect the data was constructed in Data Entry. Data Entry allows you to control and check the entry of data through three types of rules validation checking and skip and fill rules. Although the missing values can be treated within the context of the Base module, SPSS Missing Values Analysis can assist in diagnosing missing values with estimates. 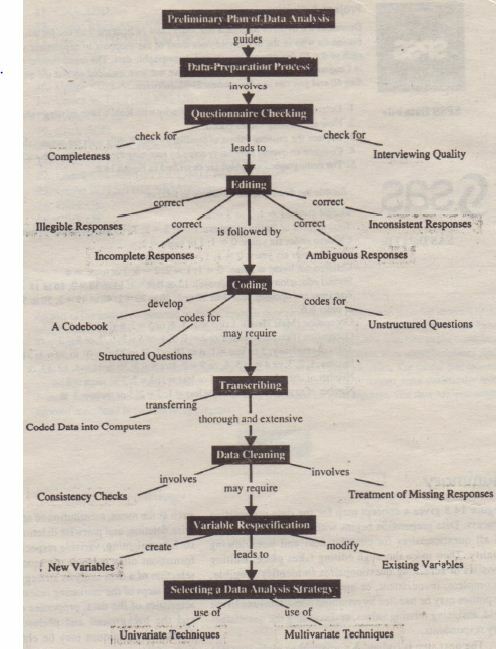 Text Smart by SPSS can help in the coding and analysis of open-ended responses. 2. 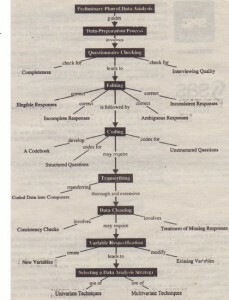 Click on COMPUTE VARIABLE. 3. 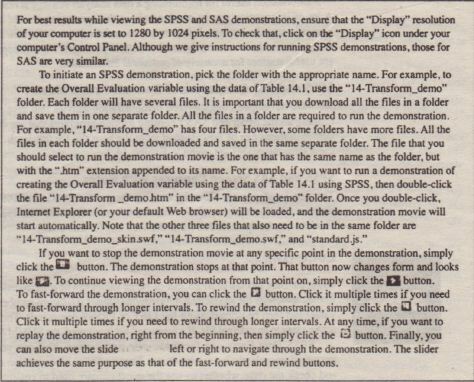 Type “overall” in the TARGET VARIABLE box. 4. Click on “quality” and move it to the NUMERIC EXPRESSIONS box. 5. Click on the “+” sign. 6. Click on “quantity” and move it to the NUMERIC EXPRESSIONS box. 7. Click on the “+” sign. 8. Click on “value” and move it to the NUMERIC EXPRESSIONS box. 9. Click on the “+” sign. 10. Click on “service” and move it to the NUMERIC EXPRESSIONS box. 11. Click on TYPE & LABEL under the TARGET VARIABLE box and type “Overall Evaluation.” Click on CONTINUE. We also want to illustrate the recoding of variables to create new variables. Income category 1 occurs only once and income category 6 occurs only twice. So we want to combine income categories 1 and 2, and categories 5 and 6, and create a new income variable “income” labeled “Recoded Income.” Note that rincome has only four categories that are coded as 1 to 4, This can be done in SPSS Windows, as follows. 2. Click on RECODEd and select INTO DIFFERENT VARIABLES. 3. Click on income and move it to NUMERIC VARIABLE -+ OUTPUT VARIABLE box. 4. Type “rincome” in OlITPlIT VARIABLE NAME box. 5. Type “Recode Income” in OlITPlIT VARIABLE LABEL box. 7. Under OLD VALUES on the left, click RANGE. Type 1 and 2 in the range boxes. Under NEW VALUES on the right, click VALUE and type 1 in the value box. Click ADD. 8. Under OLD VALUES on the left. click VALUE. Type 3 in the value box. Under NEW VALUES on the right. click VALUE and type 2 in the value box. Click ADD. 9. Under OLD VALUES on the left. click VALUE. Type 4 in the value box. Under NEW VALUES on the right. click VALUE and type 3 in the value box. Click ADD. 10. Under OLD VALUES on the left. click RANGE. Type S and 6 in the range boxes. Under NEW VALUES on the right. click VALUE and type 4 in the value box. Click ADD. SAS Learning Edition allows the user to identify missing or out-of-range values with the Filter Data tab within the Query and Filter Data task. The procedures MI and MIANALYZE in SAS/STAT also offer the capability of imputing missing values when a more sophisticated approach is required. We illustrate the use of the Base module in creating new variables and recoding existing ones using the data of Table 14.1. 2. Click on FILTER AND QUERY. 3. Move all variables to SELECT DATA tab. 4. Select the COMPUTED COLUMNS button. 7. Select “QUALITY” and click on ADD TO EXPRESSION. 8. Click on the “+” sign. 9. Select “QUANTITY” and click on ADD TO EXPRESSION. 10. Click on the “+” sign. 11. Select “VALUE” and click on ADD TO EXPRESSION. 12. Click on the “+” sign. 13. Select “SERVICE” and click on ADD TO EXPRESSION. 15. Select “CALCULATION I” and click on RENAME. 6. In NEW COLUMN NAME box. type “INCOME”. 8. Under REPLACE VALUES enter 2. 9. Under WITH THIS VALUE enter 1. 12. Under REPLACE VALUES enter 3. 13. Under WITH THIS VALUE enter 2. 16. Under REPLACE VALUES enter 4. 17. Under WITH THIS VALUE enter 3. 20. Select the REPLACE A RANGE tab. 21. Check SET A LOWER LIMIT and enter 5. 22. Check SET AN UPPER LIMIT and enter 6. 23. Under WITH THIS VALUE enter 4. As part of the analysis conducted in the department store project, store choice was modeled in terms of store image characteristics or the factors influencing the choice criteria, The sample was split into halves, The respondents in each half were clustered on the basis of the importance attached to the store image characteristics, Statistical tests for clusters were conducted and four segments were identified. 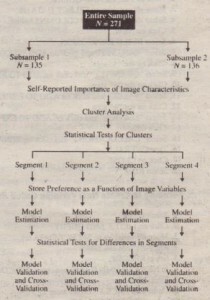 Store preference was modeled in terms of the evaluations of the stores on the image variables, The model was estimated separately for each segment. Differences between segment preference functions were statistically tested, Finally, model validation and cross-validation were conducted for each segment. 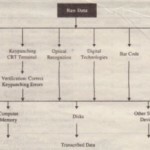 The data analysis strategy adopted is depicted in the following diagram. 1. Determine how many cases of familiarity with Kohl’s have missing &values. 2. How are missing values coded? 3. Replace the missing values of familiarity with Kohl’s with the mean value. 4. Compute an overall familiarity score by summing the familiarity will! each of the 10 department stores. Marital status: 1 = 1; 2 or 3 = 2 .